Everything is a component of some system. Each component has synergistic cause and effect relationships to the larger systems to which it belongs, within the system itself, and the smaller ones of which it is comprised. The issue is what type of effect our actions have on respective systems. 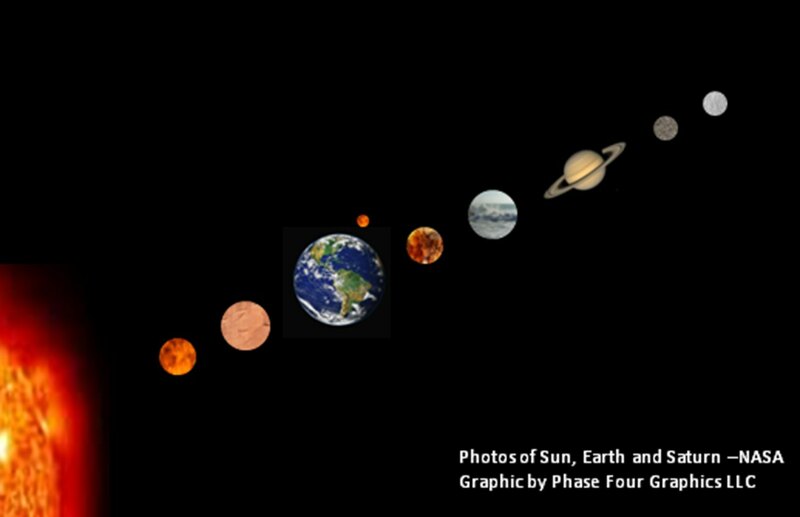 While our solar system is part of a galaxy, in turn part of our universe, it may be one part of an infinite number of parallel universes. Our human actions and those of other life forms are insignificant. As Earth takes the bumpy, somewhat convoluted orbit around our sun, life is profoundly dependent on sun activities and variations from the mean temperature. At this level the human connection to mother earth, or the continuance of human life, is insignificant. 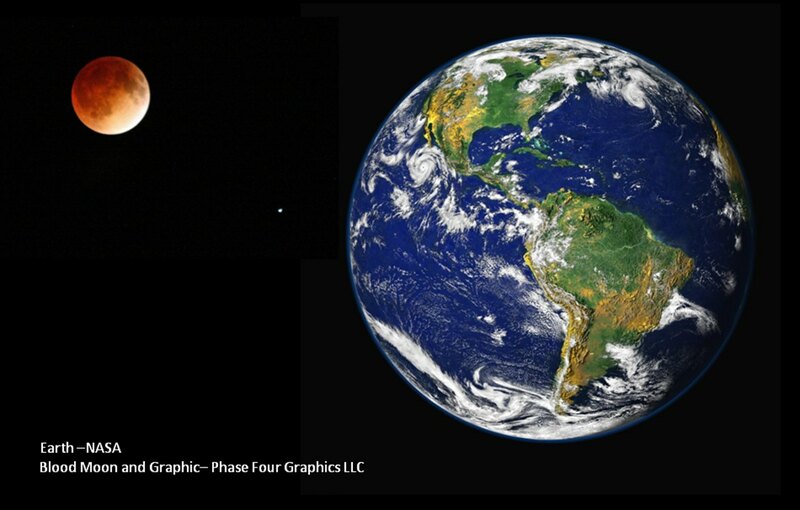 Approaching the planet earth level, for all human purposes, systems dependency significantly changes. There are integrated natural and human systems, but these relationships are not all synergistic. The earth does not need humans for its survival, but humans and living creatures and plants are dependent upon each other and the natural systems. Contrary to human's high self-opinion, we are subordinate to, but profoundly affect all living systems, and our stewardship determines how significant human activity will be on the eco-systems. The destruction of life support resources, such as water, may well lead to our own demise. The earth survives if humans go extinct, for whatever reason. Other life-forms will develop and in turn go extinct in a continuing process, until our sun expands billions of years from now, consuming the inter-planets including earth. The sun will then collapse into a white dwarf with our final physical destination, a speck in a vast universe. The natural systems and human systems follow the laws of physics, and no amount of dishonestly, parsing, or bias of opinion is going to change reality. Humans must respect mother earth or pay the consequences. Here we constantly find ourselves playing the prisoners dilemma. China and Mexico are rewarded for selling out the environment for self-advancement, and the American production system is punished by applying a different and higher standard. Analysts learn to find the root causes for problems, and take corrective action. Systems design must consider all of the options: analyze cause and effect, define the solutions, and understand all contingencies. Systems' thinking demands the application of the scientific method, due diligence, and the recognition of dependencies. Actions will bring consequences, which may be immediate or delayed, significant or insignificant. The state of the world's environment is uncertain, based on global industrial activity, energy production, infrastructure, and personal consumption. There are important voices preaching the destruction of America's industrial system as the only way to save the earth. This is false. When evaluating pollution on a global basis, over time, China will be the source of excessive green house gasses, not the United States. The solution is to build an environmentally integrated American factory system, using green facilities, and eco-friendly resource management systems such as ERP and Value Management Programs (VMP), and minimal waste concepts. Every business enterprise can make a positive statement by installing successful systems. We, at Affinity Systems, are dedicated to this mission. The following chart shows the relationships between the natural and human systems. 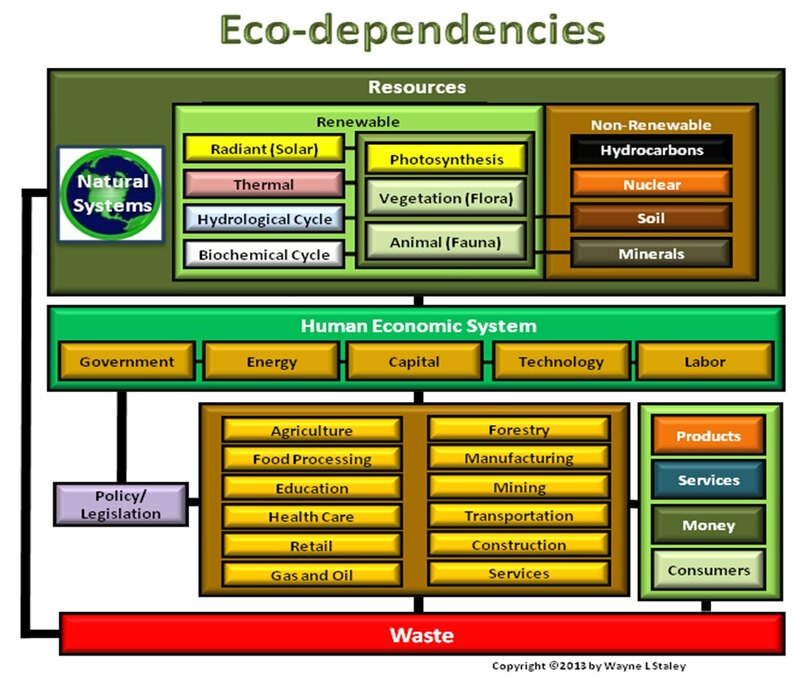 Go to Resources for a deeper analysis of Eco-dependencies. The first segment is business planning and governance, defining the direction of the business, designing the products, and acquiring the needed assets to buy/make the product. Decisions about offshore product acquisition, or Made in America, and the capital to make it happen are strategic, either directly or through the executive approval process. Our book, Pathway to Adaptability, is about using strategy and governance to build highly responsive business systems. The second segment is the fulfillment process consisting of customer order processing, resource planning, procurement, production processes, product, and distribution. Optimized systems provide true competitive advantage opportunities. We term this "business at the speed of reality", synchronizing the speed of information, processes, and intelligent response. 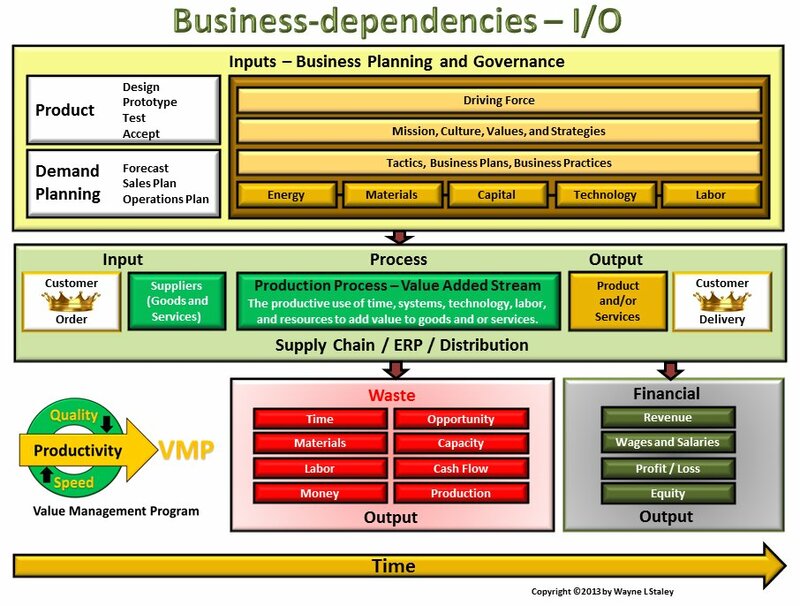 Business must construct contemporary ERP and process tools, constantly pushing the speed of reality. The use of ERP systems has evolved for nearly fifty years, but 40% of new ERP systems still fail to meet expectations. Affinity Systems reacted to this by writing ERP Information at the Speed of Reality. The book provides the information needed to build successful systems, with nothing held back. It includes topics that consulting companies cannot or will not discuss, but significantly contributes to failure. 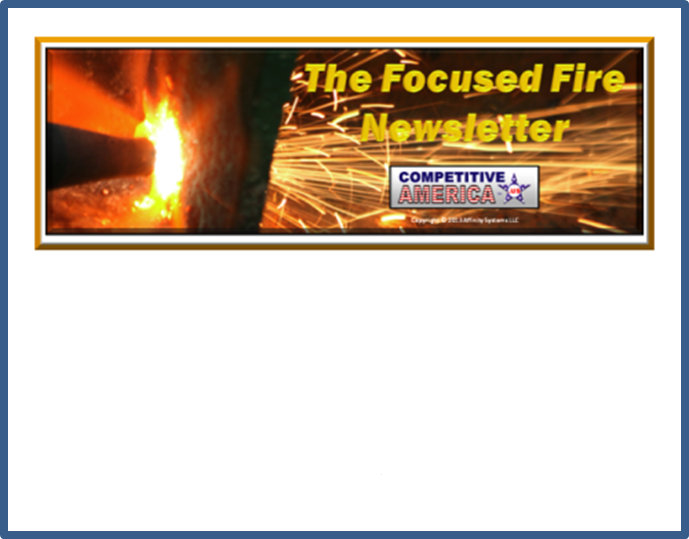 The elements of process improvement are incorporated. ERP Lessons Learned, Structured Process, our follow-up book, addresses ERP at the application and project management level. This book works systematically through the process and discusses mobile technology and the cloud. Increasing demand and favorable reviews indicates this book is achieving its purpose, to provide real value to ERP project teams, helping them install successful systems. The third segment is productivity. Business must take greater responsibility for resource management at both a macro and internal level through contemporary process improvement (Value Management Programs) where the intent is to add value to every task performed, and resource used. From our perspective, quality is the common thread, and doing the wrong thing faster will always be a losing strategy. Business is reacting to the Affordable Care Act, and Affinity Systems decided to address the topic. Since the ACA is a pervasive system, our response was the development of a new process improvement tool titled "ACTION," to help healthcare units become more productive. In this book, Productivity Prescriptions for Health Care, we translate Lean into specific patient-centric methods consistent with Primum non-nocere "First, do no harm." The fourth segment is financial. All business systems affect the financial health of a business, cash flow, profits, growth, and sustainability. Money may not buy happiness or fulfill a personal passion, but it is the lifeblood for business, with the pulse constantly monitored. Time and money are finite, fungible, and exchangeable but compete in value. We state the time/money cycle as instant production and instant use. Time elements expanding that fundamental metric contain potential for improvement. By definition, both sides of the cycle event contribute to the wealth of the local system. The tombstones of companies unable to rapidly design, make, and deliver products, strew the competitive battleground. The opportunity starts by eliminating the long supply chains from foreign sources to the USA, including products and energy. New applied technologies, such as 3-D printing, will provide tools that shorten lead-times nearly to the speed of design. Reengineering is a disruptive change process. Lean Six Sigma is a sequential and evolutionary continuous improvement methodology employed to improve process, product, and method by eliminating wasted materials, time, and inefficient methods. Either concept is applicable to systems change. 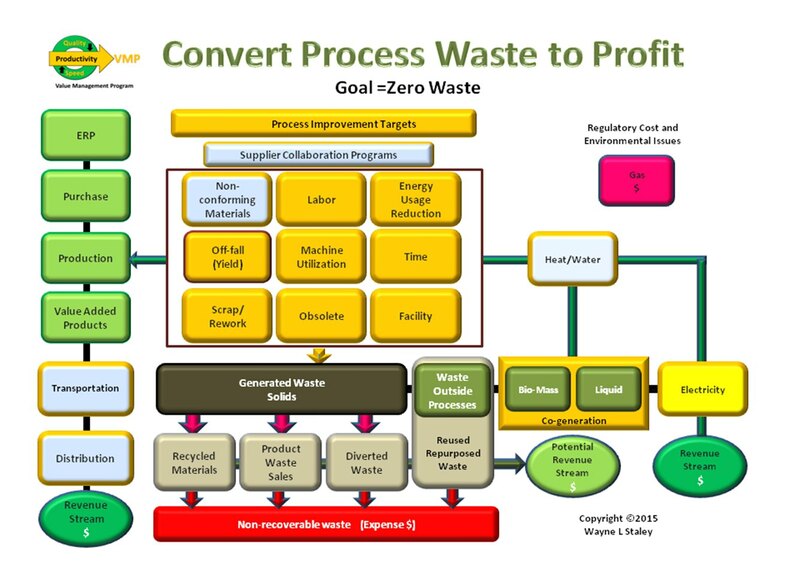 Value Management Programs include all forms of waste. The goal is finding additional revenue streams, repurpose materials/products, and eliminate or substantially reduce non-recoverable waste. To survive and grow dictates environmentally friendly, adaptive, flexible systems operating at the speed of reality. This translates into enlightened governance, contemporary ERP systems, productive process improvement programs, highly interactive and collaborative supply chains, and a zero waste mentality.